Howlin' Wolf is ranked 2nd best out of 16 albums by Howlin' Wolf on BestEverAlbums.com. The best album by Howlin' Wolf is Moanin' In The Moonlight which is ranked number 947 in the list of all-time albums with a total rank score of 2,630. Members who like this album also like: Revolver by The Beatles, Are You Experienced by The Jimi Hendrix Experience and The Velvet Underground And Nico by The Velvet Underground And Nico. 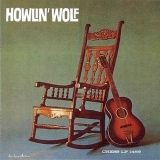 Related links: top tracks by Howlin' Wolftop tracks of the 1960s, top tracks of 1962. Showing latest 5 ratings for this album. | Show all 144 ratings for this album. I remember listening to this album late at night with a friend. Howlin' was howlin' at us. He was telling it like it is. That is a fond memory that I will never forget. Good times, good times!! You know, all things considered, this does come from 1962, and Howlin' Wolf doesn't write most of the songs...he's still a good performer, but this isn't deserving of legendary status by any means.